Ananka's Diary: Where Do You Think He's Heading? Where Do You Think He's Heading? 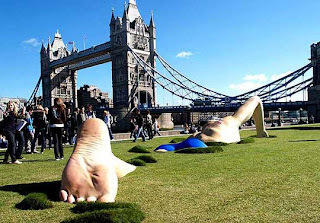 This enormous statue was erected on the banks of the Thames River in London to promote a new television show . . . about tattoos of all things. Strange. But fun to look at. Maybe it's encouraging graffiti, as a sort of "statue tattoo".